On Tuesday, 26th of June, the Department of Biochemistry and Biotechnology has been visited by Professor Sigurd Lenzen, a prominent researcher in field of diabetes of both types. Professor Lenzen held three lectures in which he reported about peculiarities of reactive oxygen and nitrogen species metabolism in pancreatic beta-cells, the role of immune system and fatty acids in the death of these cells in diabetes. It was also presented several suitable animal and cell models for studying diabetes. The lectures were attended by the staff of the department, PhD students, students, and interested school kids. 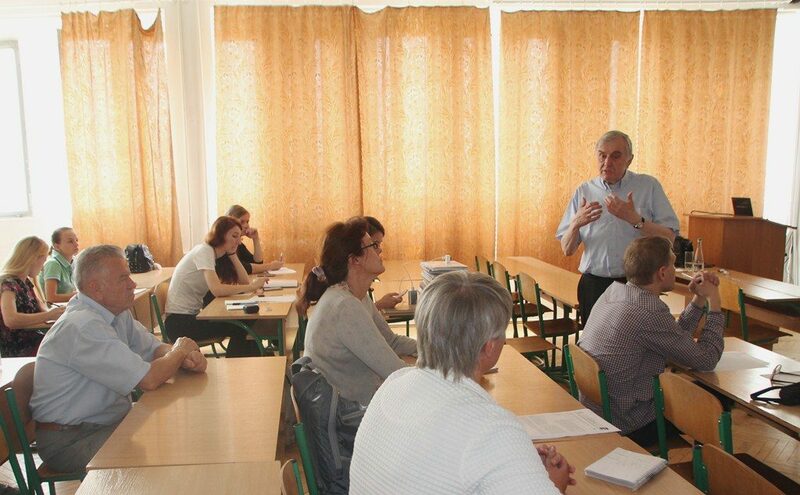 Head of the Department of Endocrinology of Ivano-Frankivsk National Medical University, Professor Volodymyr Botsyurko, and translator Ulyana Dzhaman (who worked at the department in the past) were also among listeners. Discussion was held on questions about viral etiology of diabetes, role of different fatty acids and particular carbohydrates in the development of diabetes, peculiarities of western diet nowadays and in the past, insulin resistance, and contemporary anti-diabetic therapy. Biographical note: Sigurd Lenzen is a Director of the Institute of Experimental Diabetes Research at Hannover High Medical School (Germany). He is an author/co-author of more than 200 articles devoted to different aspects of diabetes. For his research, he was awarded by Paul Langerhans Medal and Ferdinand Bertram Prize from German Diabetes Association.